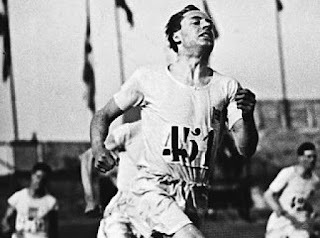 Heard Eric Liddell(1902-1945) biography during CCF Sunday's service this week and instantly I am fascinated with his story. Partly because running will always be a special sport for me but mostly because Liddell's commitment and maturity was extraordinary. His inspirational story was chronicled and documented in the 1981 movie "Chariots of Fire" garnering seven Oscar Academy nominations and winning in four categories including Best Picture in 1982. Who is Eric Liddell and what is he is famous for? In 1902, Eric was born in north-eastern China to a Scottish missionary parents. He moved to Edinburgh University to pursue Pure Science. During his university days, he was an outstanding athlete in different sports like sprint running, rugby union and cricket. He set new British record in 1923 for 100-meter sprint at 9.7 seconds. This earned him a spot (a potential gold medal) in the Olympics in 1924. He is comparable to Usain Bolt of our time who holds the world records for 100 meters at 9.58 seconds. Athletically and spiritually strong, Eric was a devout Protestant Christian. During 1924 Paris Olympics he chose to skip the Olympic 100-meter event (a track and field category he was favoured to win) because it was scheduled on a Sunday. Liddell received criticism from high places in Britain for his lack of “sportsmanship” and “patriotism.” Instead he added the 400-meter race to his profile, as the race did not involved Sunday, which he proceeded to win despite barely training for it. After his Olympic triumph, Eric returned to northern China where he spent remaining 20 years of his life in the missionary field. Athleticism and sports is NOT all about winning. It's honouring God who ultimately supplies the talent, body and strength. Capitalising on that gift to draw people to Christ.